Tuesdays! This is where we take a break from long rants about the indie life, entrepreneurship, and so on and I just talk about my favorite animal: the humble bufonid, or toads. People always tell me they never met anyone who’s had a toad until they met me, and they’re always fascinated by all the cute and shockingly human things that Yael does. I am a certified and registered Crazy Toad Lady. 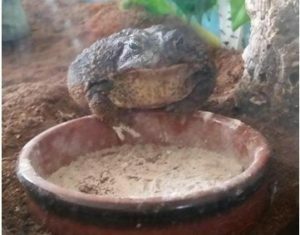 I have but one incredibly spoiled toad, but people have called me a toad-loving nutjob since childhood. Hey, the blog’s called Sonic Toad: why not discuss the amazing animal behind the name? Anyways, a common pet peeve among herpers (short for herpetology enthusiasts; the study of amphibians and reptiles for those not in the know) is that frogs and toads are frequently considered one in the same. But they’re not. 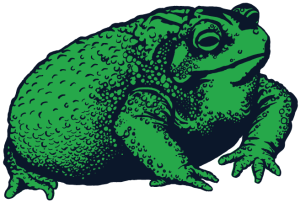 Even though my logo is bright green and not brown, a fellow herper can tell by its shape and enormous amount of warts that the amphibian in my logo is indeed a toad, not a frog. This is a green tree frog. I had two of them when I was 10, they were named Myron and Koji. Tree frogs have sticky toepads: nature’s suction cups! Frogs tend to live in water because they need it or else they’ll die. Toads also need water, but they can go for longer without it and often live on dry land as a result. Frogs’ skin is extremely moist and contact with it can take moisture out of their skin which is really dangerous for them. If you pet a toad though, you won’t take moisture out of its skin, Toads are dry and warty. Some frogs can be warty too or have a wartier appearance like the leopard frog but more often than not they have very smooth skin like the green tree frog shown here. But the main difference between the two is that a toad has dry skin while a frog has wet skin. 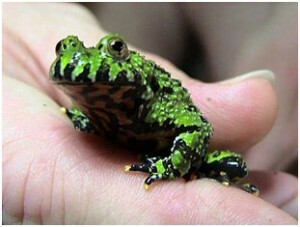 Some toad species are still easy to confuse for frogs, like the Oriental Fire-Belly Toad, because they’re green with relatively smooth skin. I can definitely see why this fella would get mistaken for a frog. Toads also have little fingers on their paws, Yael has four of them like a Simpsons character! Frogs usually have webbed front paws to help them swim. 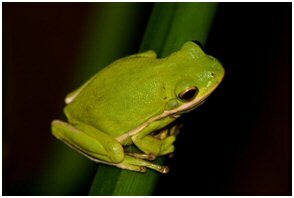 Frogs also lay their eggs in clumps while toads lay them in strings. 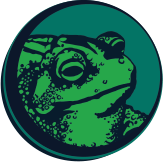 In terms of scientific orders/taxonomy, frogs and toads are both are from the Anura order (making them anurans.) There are many families in this order but only those in Bufonidae are considered “true toads”. So in English, this means that a toad IS technically a type of frog but not all frogs are toads. It’s like saying that all edible leafy greens are vegetables, but not all vegetables are leafy. Whether it’s a toad or frog though, it’s still a fascinating critter!